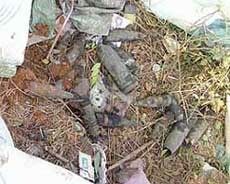 ts with the recovery of 18 live anti-aircraft mortars from a sewer pit of the Municipal Corporation near Bindra Colony on the Shivpuri road this afternoon. Just a day after failing to demolish an illegal building of an influential transporter, a demolition squad of the local Municipal Corporation today razed a number of houses of slum dwellers along the 100-feet road in Jiwan Singh Nagar this afternoon. The reduction of the rates of value added tax on several items has evoked a mixed response from the industry. Expressing resentment over not reducing VAT on auto parts, the Auto Parts Manufacturers Association of India said the government has ignored the auto parts industry that has been demanding a reduction for a long time. Punjab farmers have not only become conscious of “time” in performing various agricultural operations or following PAU recommended farm practices, but also are they now more aware of the importance of conservation and management resources as also environmental degradation. They are also concerned about the menace of stray cattle. The Income Tax department today launched survey operations against half a dozen customs clearing agents in the city, including one clearing agency in Mandi Gobindgarh town in Fatehgarh Sahib district, which falls within the jurisdiction of Ludhiana Chief Commissionerate. Taking a serious note of the news-item published in a section of press regarding the illegal destroying of 15 units of blood and hiding of the empty pouches by some employees of the Civil Hospital, Mr Anurag Verma Deputy Commissioner, Ludhiana, has ordered an inquiry by Mr J.K. Jain, Executive Magistrate, Ludhiana. Two unidentified car borne youths snatched a car from a resident of Jalandhar from near Gurdwara Manji Sahib yesterday evening. The Department of Central Excise and Customs maintained its thrust on the compliance of service tax and measures to check duty evasion during year 2005. Having exceeded the targeted revenue collection of Rs 940 crore for the previous financial year, the department appeared to be all set to repeat the performance if senior officials were to be believed. Traditional things may go out of circulation for some time, but they come to the rescue when other modern gadgets fail. So is the case with angithis which otherwise extinct are now back on the streets and selling like hot cakes. 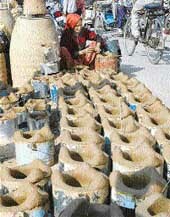 Due to harsh winters and shortage of electricity and LPG, the city residents are turning to age old angithis not just for getting warmth during long, cold nights but also for cooking food. Mr Anurag Verma, Deputy Commissioner, has invited applications for Stree Shakti Puraskars to be given by the Ministry of Human Resource Development (Department of Women and Child Development), Government of India, to the women who had done exemplary services for the welfare of women and children. Under the scheme of assistance to disabled persons launched by the Union Ministry of Social Justice and Empowerment, grant-in-aid would be given to the disabled persons for the purchase, fitting of aids and appliances (ADIP scheme) through the organisations already working for the welfare of the disabled, this was disclosed by the Deputy Commissioner, Mr Anurag Verma, here today. Mr Harnam Das Johar, Education Minister, Punjab, has called upon the youth to wipe out the corruption from society. Mr Johar said this while addressing a gathering on the occasion of the 121st founder’s day of the Indian National Congress (INC) here today. The SSP here claimed to have arrested two persons allegedly involved in a robbery attempt at Mata Rani Mohalla here last week in which six armed robbers tried to rob an aged couple. With a view to ensure good medicare facilities to the people in rural areas, Deputy Commissioner, Mr Anurag Verma, has appealed to the rural people to come forward and get benefited from the new insurance scheme, Sanjivani Health Insurance, being implemented by the Cooperative Department through cooperative societies in the villages. Punjab Agricultural University has submitted to the Chancellor, General S.F. Rodrigues (retired) a road map to over come “economic crisis in Punjab” and a blue print for “collaborative agro-based research and development” between the university and industry to promote scientist-entrepreneur-farmer linkage. The university action plan on these issues is intended to change the face of Punjab agriculture and profile of rural development. Fisheries professionals have set their eyes on the Indus river system resources to give impetus to the “blue revolution” in the country. The Central Institute of Post-Harvest Engineering and Technology CIPHET (behind Radha Soami Satsang Ghar, Hambran Road, Ludhiana) is celebrating its foundation day on December 29. Dr Nawab Ali, Deputy Director-General (Engineering), Indian Council of Agricultural Research, New Delhi, will be the chief guest. The Nijikaran Virodhi Front stated in a press note that the District Education Officer, Primary, Ms Harvinder Kaur, today agreed to fulfil certain demands of teachers and declared January 18, 2006 to be the next date for taking up the pending demands of the teachers. The outbreak of diseases like gastroenteritis, dengue and malaria at regular intervals in the city and the detection of a polio case towards the end of the year, the first in past three years from anywhere in the state, kept the health administration on its toes all through the year. 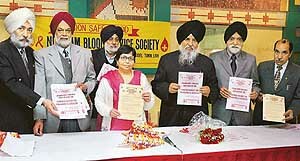 The Nishkam Blood Service Society, a voluntary body which came into existence here today, has pledged to work for the propagation of voluntary blood donation and to make the noble task a mass movement in the region to meet the demand for safe blood for critically ill persons and trauma victims. A warm farewell was given to former international kabaddi star Devi Dayl, who was working as senior kabaddi coach with the Punjab Sports Department, here today. Devi Dyal, who dominated the kabaddi arena during late sixties and seventies, retires on December 31 after putting in 35 years of service.